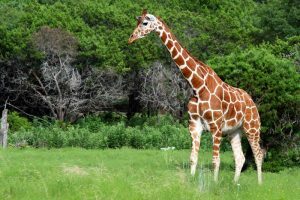 Reticulated giraffes, sometimes called the Somali giraffe, are among the tallest mammals in the world. They are sometimes considered a subspecies of the Northern giraffe. 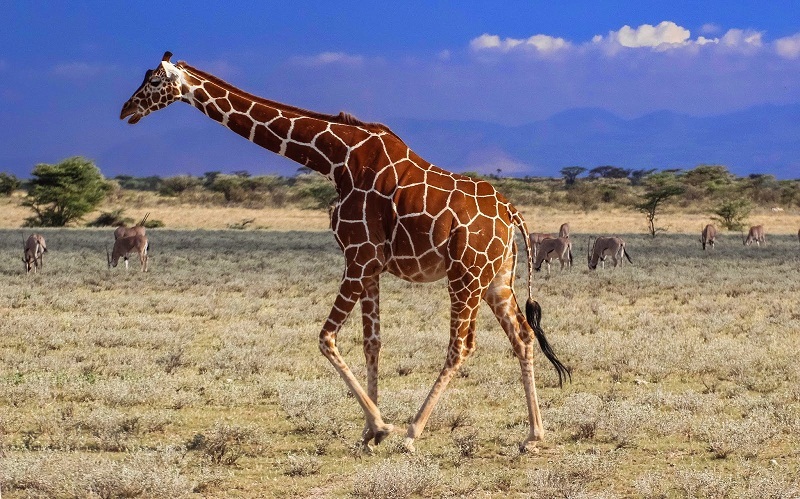 Their long necks sometimes become a hindrance for them when they are at watering holes, as they have to spread their legs considerably to make their mouth reach the water. They can drink around 18 gallons of water in one go. 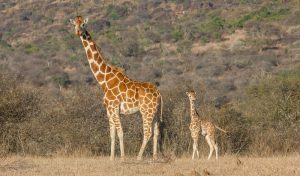 Size – Males reticulated giraffes can measure up to 18 ft (5.5 m), while females can reach a height of 17 ft (5.2 m). Weight – Males usually weigh between 2,400 and 4,250 lb (1,090-1,930 kg), and females between 1,540 and 2,600 lb (700-1,180 kg). 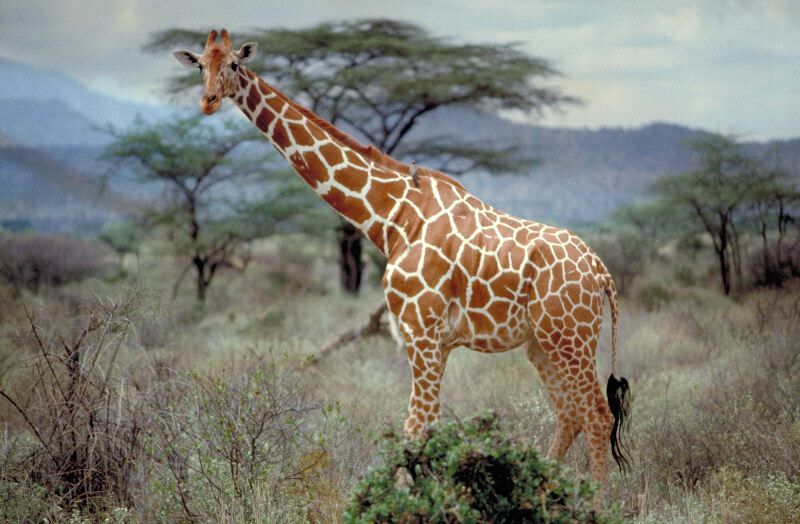 Neck Size – Their necks have a length of up to 8 ft (2.5 m). 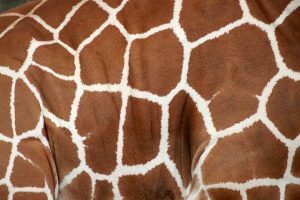 Color – They have polygonal and large liver-colored spots outlined with a network of white lines. 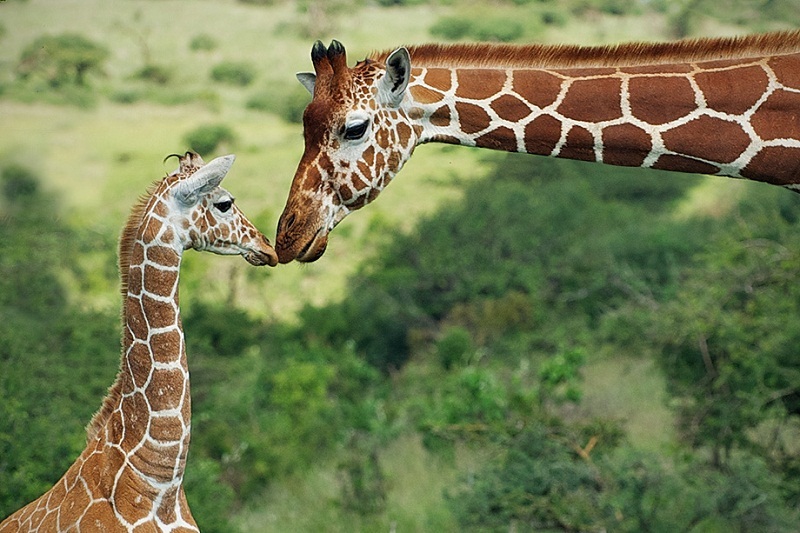 Reticulated giraffes are native to Southern Ethiopia, Somalia, and Northern Kenya. They live in seasonal floodplains, savannahs, woodlands, and rainforests. 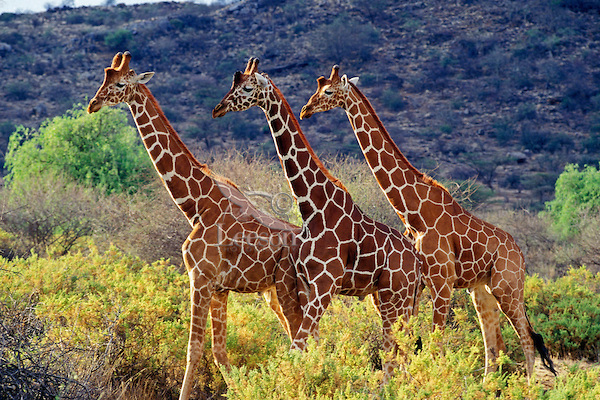 Reticulated giraffes live in herds with up to 10 to 20 individuals. This may increase depending on food availability. They are at their most active during the morning and evening. They sleep while standing on their feet during the night. They mainly feed by browsing throughout the day. They eat more than 100 different species of plants. Acacia remains their favorite. Sometimes, they also feed on the carcasses of antelopes, primarily chewing on the dried bones to get calcium. Their breeding season falls between May and August. Males engage among themselves in a ritual known as necking, wherein two individuals swing their necks at each other, and the last giraffe standing wins the mating rights with the female. They also use the horns (called ossicones) at the top of their heads to ram each other. After a gestation period of around 450 days (15 months) a single calf is born. Calves are about 6 feet tall when they are born and can weigh around 200 pounds. They gain the ability to stand up within an hour after birth and start feeding on their mother’s milk. 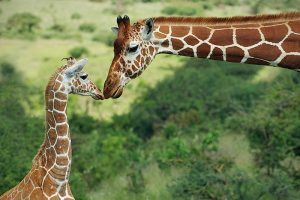 Female offspring reach sexual maturity when they are about 4 years old, while male reticulated giraffes attain gusto much later when they are 10. They usually live for around 25 years in the wild. They communicate with each other through bellows, hisses, snores and grunts. They also use an infrasonic sound, which is inaudible to humans. 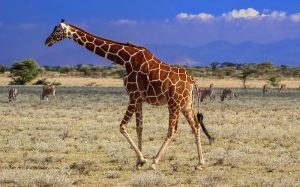 The long necks are believed to be the result of the fact that only individuals with the longest necks get the mating rights. Their long legs help them to run at speeds of up to 35 miles per hour. Reticulated giraffes are ruminants as their stomach is composed of four chambers. Food passes through the first chamber and water goes directly into the second. 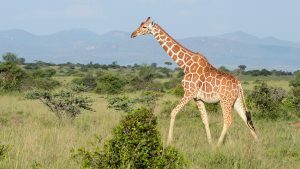 The food is digested in part and when the giraffe is not eating during the day, this fermented concoction, known as cud, is regurgitated and chewed on to further break it down, before sending it to the third and fourth stomachs to further break it down for excretion. They are preyed upon relatively rarely because of their long necks helping to spot threats from afar, but lions sometimes prey on juveniles, as do crocodiles and spotted hyenas. 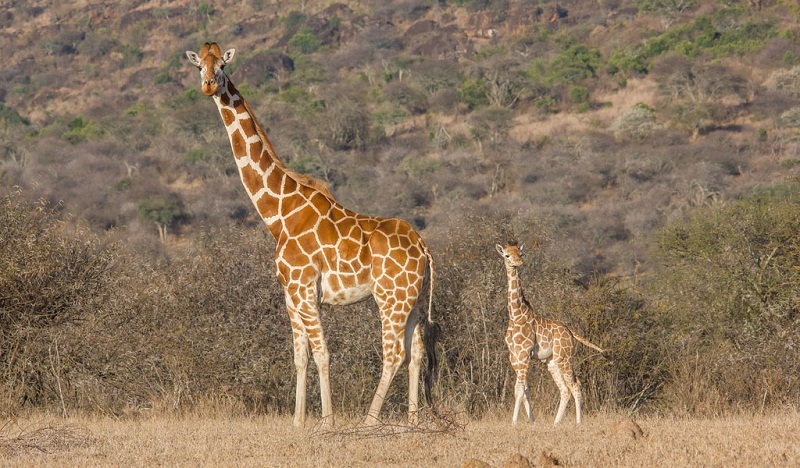 The IUCN lists the reticulated giraffe under their ‘Vulnerable’ category. 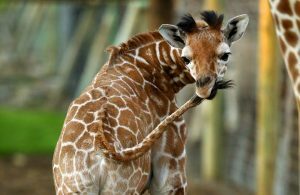 Humans pose the biggest threat to reticulated giraffe populations as they are routinely hunted for the skin and hair. Conservation efforts are, however, underway to ensure that this species does not need to be classified as endangered. Reticulated giraffes are among most commonly seen in zoos, along with the Rothschild giraffe. 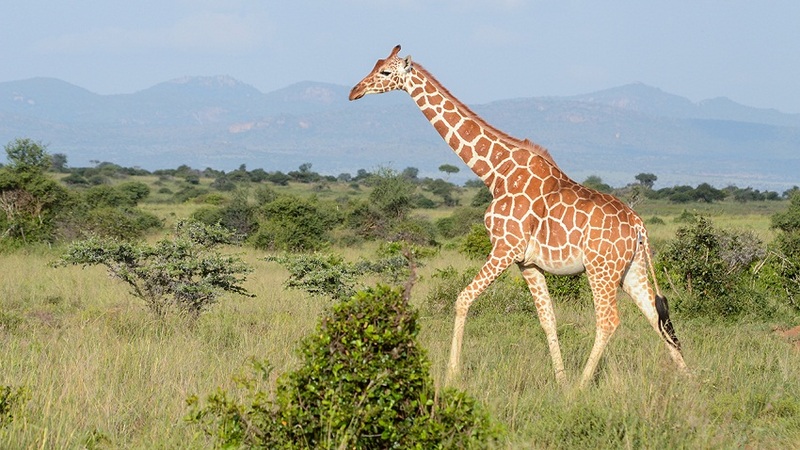 It is estimated that there are around 8,500 reticulated giraffes in the wild.